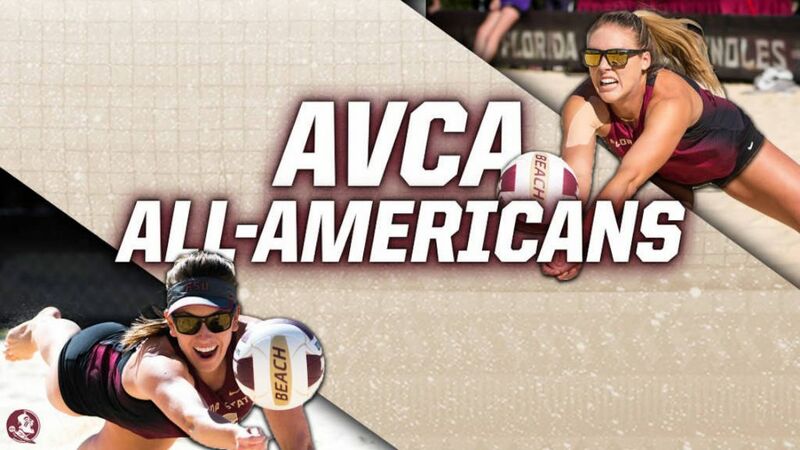 TALLAHASSEE, Fla. – Florida State beach volleyball graduate senior Leigh Andrew and sophomore Brooke Kuhlman were recognized as Beach Volleyball All-Americans on Thursday as announced by the American Volleyball Coaches Association (AVCA). Playing as FSU’s No. 1 pair all season long, Andrew and Kuhlman led the Seminoles to their second straight NCAA Beach Volleyball Championship appearance and a fourth-place finish in Gulf Shores, Ala. The Seminole duo finished the season with an 18-11 dual-match record, while posting victories over 14 ranked teams, including eight wins against Top 10 teams. Andrew and Kuhlman were a pivotal part in FSU’s success during the 2017 season that resulted in the school’s second straight Coastal Collegiate Sports Association (CCSA) Championship and the fourth-place finish at the national tournament. The duo went 9-2 against CCSA competition, including a 4-1 record during the conference tournament en route to a spot on the CCSA All-Conference First Team. Andrew and Kuhlman are the seventh and eight Seminoles to earn All-America honors. The Noles have collected 11 All-America honors overall – the third-most nationally all-time. Andrew and Kuhlman join the proud list of FSU beach All-Americans that includes: Aurora Davis (2012 & 2014), Jekaterina Stepanova (2012), Brittany Tiegs (2012), Sarah Wickstorm (2013), Julie Brown (2016) and Jace Pardon (2013-14, 16). Andrew will be leaving Florida State after just one season with the Noles as she transferred in from North Carolina, where she played indoor volleyball. In her one season Andrew amassed a 21-16 record with 20 of those wins coming in the No. 1 position. Andrew made an immediate impact for the Garnet and Gold as she played on Florida State’s number one pair from match one through the end of the season. After just one season Andrew leaves Tallahassee with the fourth most win at the No. 1 positon in school history. Kuhlman is just getting started for Florida State as she finished her sophomore season. She capped off her second season with a 22-14 record with 17 of those wins coming at the No.1 position. Kuhlman heads in to her junior season with 28 career wins. Andrew, who is currently pursuing a master’s degree in sport management, plans on graduating from Florida State in December of 2017. Kuhlman is currently pursuing a degree in finance and plans on graduating in 2019. Leigh Andrew/ Florida State , Gr., Fort Lauderdale, Fla.
Brooke Kuhlman Florida State, So., Naples, Fla.
Molly Turner/ Grand Canyon, Jr., Naperville, Ill.
Rachel Nieto Long Beach State, Jr., Walnut Creek, Calif.
Madalyn Roh / Pepperdine, So., Scottsdale, Ariz.
Delaney Knudsen Pepperdine, Sr., Valencia, Calif.
Morgan Martin / Hawai’i, Fr., Mission Viejo, Calif.
Mikayla Tucker Hawai’I, Sr., Placerville, Calif.
Kelly Claes/ Southern California, Sr., Fullerton, Calif.
Sara Hughes Southern California, Sr., Costa Mesa, Calif.
Allie Wheeler/ Southern California, Sr., Saratoga, Calif.
Savannah Slattery/ Loyola Marymount University, Fr., Malibu, Calif.
Sarah Sponcil Loyola Marymount University, Jr Phoenix, Ariz.
Payton Rund/ Saint Mary’s, So., Albany, Ore.
Lindsey Knudsen Saint Mary’s, So., Santa Clarita, Calif.
Two Pairs Split Matches on Day One of USAV Collegiate Beach Championship.